If you are new to using professional photographers, there are a few things to consider before you start your search. 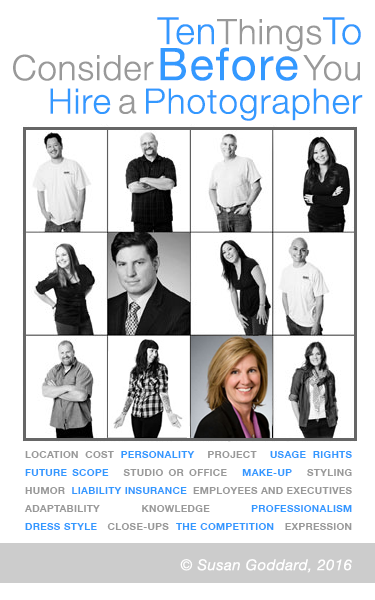 Hiring the right photographer is about choosing the right look and feel for the project you need to complete. And hiring a school portrait photographer to do faux-journalistic shots of your office or intimate portraits of your people is usually not the best idea. Nor is hiring a product photographer to shoot architecture. Although many photographers are well-rounded, it’s usually better to use one that has a particular specialty. And if you haven’t thought about insurance, location, scheduling, seasonality, talent or dress-code, we invite you to read our free pdf. Call us if you have questions. Download a free pdf – It’s a quick read. Click below.